A boat covered for protection. Both mold and mildew are fungal infestations that thrive in warm, dark, damp environments. Keeping your boat cover mold- and mildew-free requires cleaning the cover regularly and not storing the cover until it is completely dry. 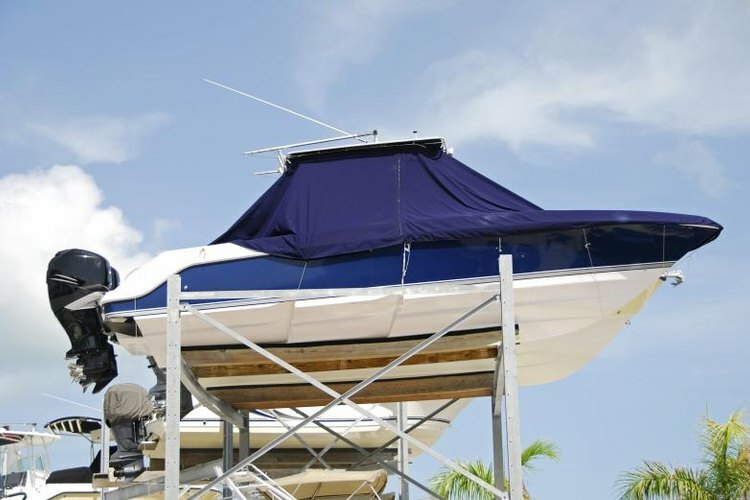 Because mold and mildew can eat through the fabric of your boat cover, don't allow large patches to develop; clean the cover the instant you notice a few spots. You can clean your cover yourself or employ a professional awning cleaner. Cover manufacturers recommend monthly cleaning for your boat cover. Begin by brushing off any loose dirt, and then hose down the cover with water. Next use a soft bristle cleaning brush to apply a cleaning solution made of soap and water. Don't use detergent, because it may strip off waterproof coatings. Take a brief break while the cleaning solution permeates the fabric, and then hose off the cover until the water runs clean. Let the cover dry completely, ideally in direct sunlight to reduce or prevent mold growth. Once the cover is completely dry and mold-free, apply a waterproofing finish. If mold or mildew spots remain after regular cleaning, mix together a gallon of water, a cup of bleach and a quarter-cup of mild soap. Apply the solution to any mold or mildew spots, and let soak for at least 15 minutes. Sponge off the mildew and rinse thoroughly.